Ah, Bali. Many place of interest in it, and they are beautiful of course, but now we’re not talking about that. Now, its time to give you the information about Balinese Wedding Traditions. In Bali, they use the Hindu Marriage ceremony, because their religion is mainly Hinduism. Hinduism in Bali has its marriage ceremonies, of course they do not ignore the customs that already exist in society. Because Hindus is base on the Book of Vedas. Also, it based on Śmrti and Hindu law based on customs that have been passed down through generations in a place called the Acara. Because of performing a ceremony based on the Vedic scriptures and following the customary ordinances that have been passed down from generation to generation, they belief that they will gain happiness in this world (jagaditha) and everlasting happiness (Moksa). However, in Balinese wedding customs, the entire cost of the procession is paid by the groom. In the process , there are several stages that must be pass. Before being ratified as a married couple in customary ties. The whole stage is usually done at the groom’s house. Then the bride is delivered to return to her parents’ house. She needs to ask their permission to be allowed to live with her husband. Looking for a good day (dewasa) is usually done by the groom, by asking for clues from a Sulinggih or someone who is used to giving dewasa. The dewasa are usually consecutively in accordance with the events in the implementation of marriage ceremonies. Among others there are dewasa pangenten, dewasa mererasan, dewasa picking the bride, and dewasa pawiwahan. Actually, how to choose a good day according to tradition in Bali is based on the calculation of wariga and dewasa of course. However the calculations are quite complicated. So, people rarely know how to use wariga and dewasa. However, fortunately with the shrewdness of a person in the calculation of wariga and dewasa, he composed wariga in the form of a modified international calendar that until now still used by the people of Bali. 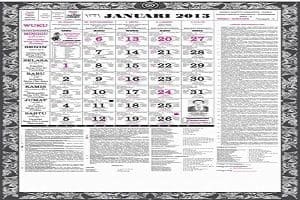 His name is Bambang Gde Rawi, the compiler of the calendar. This ceremonial procession aims to prepare the prospective bride from the life of a teenager into a wife and a housewife. Starting from begging a blessing to God Almighty to reduce happiness to the prospective partner and given a good offspring. This procession continue in the afternoon, where the prospective bride covered with herb from peacock leaves, turmeric, kenanga flowers, and mashed rice . Her hair must also be wash with straw water. After the shower procession, the ceremony continued in the bridal chamber or room. Before entering the room, the prospective bride has prepared offerings. The bride who have entered the room are usually not allowed to go out of the room until the prospective husband came to pick her up. At the pick-up ceremony, the entire bride’s body is cover with a thin yellow cloth. However, this ceremony symbolizes the bride is ready to pursue life with a new partner and bury the past as a teenager. Mungkah lawang which means open the door is a ceremony that aims to pick up the bride who was in the room. In this ceremony, the male will knock on the door of the prospective bride’s room three times with Balinese music accompaniment and Balinese song. Also, The content of the song is a message saying that the groom has come and begged to be opened the door. The ceremony is performed at the time when the two brides are in the yard of the groom’s house. Mesegehagung ceremony meant as a welcome ceremony to the prospective bride. Both brides are taken to the bridal chamber. Arriving at the bridal chamber, the mother of the groom will enter the room and ask the bride the yellow cloth. The cloth covering her body is opened and exchanged for kepeng silver coins stuck with Bali thread straps. The ceremony aims to cleanse or purify the bride and groom of negative energy in both of them. The ceremony is led by a custom leader or commonly called Balian. The Madengen-dengen or Mekala-kalaan ceremony has the meaning and purpose of ‘clean and purify’ the bride and groom as part of Bali traditional wedding ceremony. This ceremony is also a form of testimony before witnessed by God, relatives, and also local people. Guided by Balian or Pemangku, then the two brides are led to the ceremony, performing ceremonies according to the to Hinduism . Makala-kalaan symbolically aims to cleanse the bride from the influence of negative energy. Indeed, the meaning of the ceremony of Mekala-kalaan is a confirmation of marriage of the bride and groom through the process of body and spirit purification , to enter into married life happy and prosperous family. This procession is no less important than other ceremonies. This ceremony is the completion of the process of self-cleaning of both parties. In this ceremony the groom and the lady wearing the great clothing. The purpose of this ceremony is to ask the blessing of Almighty God for the marriage and also the new family life is sanctioned. The event was led by a Marejan. Several days after the formal bride becomes husband and wife, then on the agreed day, the two sides of the family will take the bride to go home to the bride’s parents. For what? to perform the ceremony Mejamuan. The ceremony is performed to plead goodbye to both parents and relatives of the bride. Also to the ancestors. The ceremony is says that this time the bride has legitimately become part of the groom’s extended family. 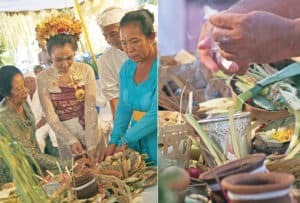 This ceremony as well as the last ceremony, where the ceremony is a family of men will bring a variety of typical Balinese food, such as cake pillow, apem, alem, cerorot, kuskus, nagasari, kekupa, rice, sugar, coffee, tea, betel nut, and more of Balinese cuisine. Finally, that’s it, all you need to know about Balinese Wedding Traditions. Well this is an unique ceremonies, maybe you can take a look at it if you lucky enough. Okay, enjoy it and have a great day !